The cry which the people of Jerusalem were accustomed to raise while marching in procession and waving branches of palm, myrtle, and willow in the joyous Sukkot festival, especially on the seventh day, when the willow-branches of the "lulab" procession were piled up and beaten against the altar (Suk. iii. 9, iv. 5). The willow-branch thus received the name "hosha'na" (Suk. 30b, 31a, 34a, 37a, b, 46b); and the seventh Sukkot day was called "Day of Hosha'na" or "Hosha'na Rabbah." It was a popular festival, of ancient, probably Canaanitish, origin, connected with the prayer for the year's rain (Zech. xiv. 8-17); the multitudes accompanied the priests each night of the Sukkot feast to the spring of Shiloah, where the water for the libation ("nissuk ha-mayim") was drawn amidst great solemnity and rejoicing (Suk. v. 1-4), while the last day formed the climax of the festivities. "Anna Adonai hoshi-'ah-nna" (Ps cxviii. 25), the refrain of the psalms recited by the assembly, was, probably owing to constant repetition, abbreviated by the people into "Hosha'na," just as the old Canaanite cry "Hoi Dod" ("Wo Adonis") was turned into a common interjection, "Hedad." Thus "Hosha'na" became a popular cry used in solemn processions where with was connected the carrying of the palm branches as described in I Macc. xiii. 51 and II Macc. x. 7. According to John xii. 13 (in the Sinaitic codex), which has the story preserved in its original form, the same cry was raised by the multitude on the occasion of Jesus' arrival at Jerusalem. They "took branches of palm-trees, and went forth to meet him, and cried, Hosanna: Blessed is he that cometh in the name of the Lord"—that is, the verse following "Anna Adonai hoshi'ah-nna" in the Hallel psalm— and then called him "the King of Israel." Luke (xix. 38), writing for the Gentiles, omits the palm-branches and the Hosanna cry, and changes the Biblical verse into "Blessed be the King, that cometh in the name of the Lord," while adding the Messianic salutation of the angels in the birth story, "Peace in heaven, and glory in the highest." Mark (xi. 8-10) combines the two versions, and changes the words of Luke into "Blessed be the kingdom of our father David, that cometh. . . . Hosanna in the highest," the closing words of which no longer give any sense The same is the case with the words "Hosanna to the son of David" in Matt xxi. 9, "Hosanna in the highest" being a corruption of the original version. The Psalm verses recited have been interpreted by the Rabbis also as referring to the advent of the Messiah (see Midr. Teh. to Ps. cxviii. 17, 21, 22; comp. Matt. xxi. 42). Wünsche ("Erläuterungen der Evangelien aus Talmud und Midrasch;" p. 241) thinks that the Passover and the Sukkot festivals have been confounded by the Gospel narrator (see also Festivals). 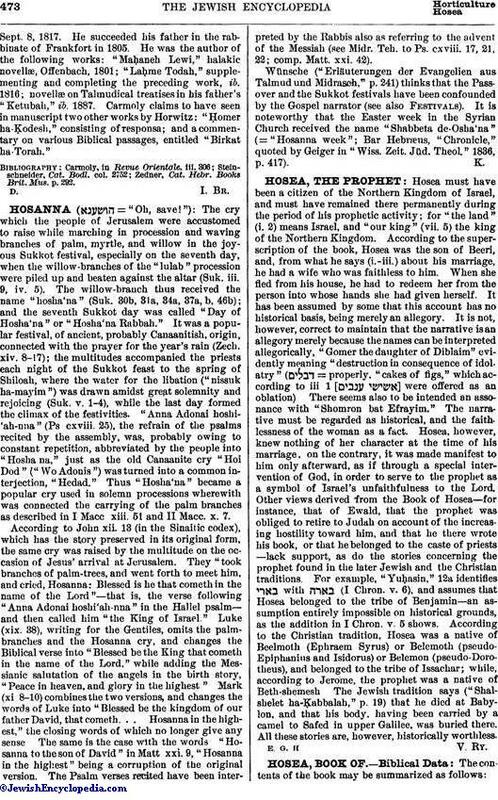 It is noteworthy that the Easter week in the Syrian Church received the name "Shabbeta de-Osha'na" (= "Hosanna week"; Bar Hebræus, "Chronicle," quoted by Geiger in "Wiss. Zeit. Jüd. Theol." 1836, p. 417).